With the day warm enough for sunbathing on the lawn of the Schuylkill Banks park, many people were out enjoying the river’s beauty and taking advantage of the nearby trails—and many people stopped to wave at the crew, thanking them now and then for keeping the waters clean. Butler, an aquatic biologist and manager of Philadelphia Water’s Environmental Restoration & Maintenance Program, was joined on the water that day by Declan Patterson, a Drexel University student working with the Office of Watersheds through a co-op program; Dimitri Forte, with the Watershed Field Services Group; and Richard Anthes Jr., an environmental scientist with the Office of Watersheds’ Ecological Restoration Group. By the end of the day, the workboat, which had launched at 9 a.m. sharp from Fort Mifflin, near the confluence of the Schuylkill and Delaware Rivers, was packed with full 55-gallon trash cans and overstuffed clear plastic trash bags, the collected litter sorted into recyclable and non-recyclable items. While impressive, the haul of 210 pounds was standard for a day on the river. Similar collections take place about two to three times per week, March through October, on the tidal sections of Delaware and Schuylkill. Further upstream, a 22-foot pontoon-style skimmer boat takes on trash in the shallower waters during weekly trips. Last year, the pontoon vessel alone removed nearly four tons—that’s 8,000 pounds and 10 full Dumpsters—of this type of trash from Philly’s riverbanks and waterways. A third boat, the 32-foot R.E. Roy, also helps to (among other things) keep trash at bay, collecting 29,000 pounds of trash from our large tidal rivers in 2015. So far in 2016, Philadelphia Water boats have collected 4.8 tons of trash during 72 trips (50 days on the Schuylkill and 22 on the Delaware). Among the trash collected, recyclables accounted for over 40 percent of the weight, or nearly 2 tons. All of this is done under Philadelphia Water’s little known but important Marine Debris and Floatables Management Program. Understandably, many people don’t think of litter collection when they think of work done by their water department. In reality, the Marine Debris and Floatables Management Program is built into the regulations and permits that allow Philadelphia Water to maintain a vast network of stormwater and sanitary sewers, waste treatment plants, and more. If you haven’t heard the term “floatables” before, think of the trash like plastic bottles, cigarette butts, plastic bags and discarded wrappers that you likely see on city streets every day. Up there, it’s just your run of the mill (depressing) litter. Once rain washes this buoyant stuff into our waterways, it gets categorized as floatables. Because floatables can sometimes find their way into rivers and creeks by travelling through one of Philly’s 75,000+ storm drains first, controlling this trash is considered to be a part of combined sewer system maintenance for Philadelphia and other cities, like New York. For the same reason, combined sewer outfalls—places where combined sewer pipes empty into waterways—can be floatables hotspots and are often targeted by Philadelphia Water boats during trash skimming patrols. The boats play an important role in a much bigger effort to remove litter and other debris from our waterways, an effort that includes work ranging from inspections done by our Inlet Cleaning crews, which hit about 275 storm drains each day, to the heavy lifting of the Waterways Restoration Team, which removes “trash” as big as abandoned cars while doing tasks like repairing eroded streambanks. Outside of Philadelphia Water, volunteer cleanups play a huge role, engaging citizens in watershed stewardship and extracting mind-boggling volumes of trash annually. For example, Keep Pennsylvania Beautiful reported a total of nearly 1.3 million pounds of trash removed by 29,259 volunteers during 1,003 cleanups along the Schuylkill River in 2015. Those figures include volunteer events like the popular Schuylkill Scrub, organized by the Schuylkill Action Network, and tally trash collected from the headwaters to all the way down to Philadelphia. Public-private partnerships, like the United By Blue (UBB) volunteer events sponsored in part by Philadelphia Water, also help to chip away at the problem. UBB events along Philadelphia waterways have collected 25,657 pounds of trash so far in 2016. This August, the nationally-acclaimed Living Lands and Waters organization is returning to Philadelphia for a second round of cleanups after collecting close to 33,000 pounds of trash along the Delaware and Schuylkill last summer. You can sign up now if you want to give a hand. While those efforts are invaluable, Philadelphia Water’s floatables fleet does something most volunteers can’t: reach the inaccessible nooks and crannies along steep banks and other places people can’t walk to, but often harbor lots and lots of trash. The “skimming guys” also live up to their name, literally skimming the water with large rubber nets designed to capture even small bits of litter like broken-down Styrofoam. 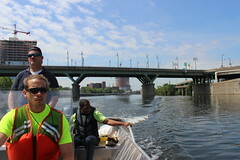 In addition to assisting the Watersheds Field Services Group’s “floatable” litter removal efforts, the boats also allow Philadelphia Water to do tasks including surveying river and infrastructure conditions, aquatic life studies, water quality assessments, wetland surveys and bathymetric profiling of the rivers’ bottoms. Butler, who relies heavily on certified boat operators, such as Jim D’Agostino, to pilot the floatables collection trips, says the litter pulled from our waterways isn’t just ugly; it can do real harm both directly and indirectly to the aquatic and semiaquatic fauna residing within Philadelphia’s Watersheds. The work of the skimming boats, the Inlet Cleaning Crews, the Waterways Restoration Team and the many volunteers mentioned above—it’s all aimed at one big task: getting litter out of our waterways and off our waterfronts. Filling up a few Dumpsters with a bunch of trash that was just making your favorite local waterway look bad? That’s always rewarding. But, as anyone who’s done this work can tell you, it’s never enough. And there’s always a sense that it won’t be long before more litter shows up. The hard truth is, unless our neighborhoods and streets are litter free, our rivers and creeks won’t be either. In addition to helping with the cleanups listed on our calendar and elsewhere, you can help by working with the Streets Department’s Pick It Up, Philly! campaign, Keep Philadelphia Beautiful, and your local community group. You can also help cut waste by doing things like choosing reusable water bottles and encouraging others to do the same—tell your friends, kids and neighbors that cleaner streets mean cleaner rivers and creeks. And, if you see a boat full of people scooping trash out of the river the next time you take a jog down the Schuylkill River Trail, now you’ll know: that’s probably Philadelphia Water, working to keep our waters clean.